Yes, it really is possible to come across as a virtuoso guitarist by knowing just four guitar chords, as demonstrated in the video above. I’d like to back track to my own experience of learning to play the guitar, a route which I’m guessing a great many others will have followed. I started learning the guitar in the 70s, my first guitar was a nylon string strung guitar – it wasn’t a classical guitar, it was then known as a ‘folk’ guitar. I took folk guitar lessons from a lady down the road. She basically showed me a few guitar chords e.g. C, F and G, then I would spend the lessons writing out lyrics to songs which I then had to sing and play – I hated this bit! I also found the style of songs and playing very underwhelming. The dull sound of the guitar, the ‘folky’ songs, not that there was anything wrong with the folk genre – but this wasn’t going to turn me into Jimmy Page or Richie Blackmore. I was around 12 years old at the time and music was becoming a major influence in my life. So my parents invited the teenage son of one of their friends to come and show me some more ‘up to date’ songs. This was great because he would spend two to three hours on a Saturday showing me Beatle, Rolling Stones and Who songs. From here on I taught myself. 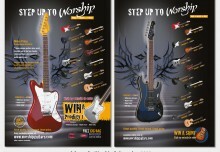 I progressed to a steel strung acoustic followed by my first electric guitar. I learned finger picking, I listened to riffs on 45rpm records, slowed to 33rpm so I could learn them (no such thing as pitch trainers and Riffstations in those days) – luckily I had a good ear for music, so I could pick up songs quite easily. But it took me a long time, in fact many, many years to understand the methodology of guitar chords. This was because nobody ever showed me. I played in bands, even adopting playing the bass for one band – but I did everything by feel and ear. I realised that certain guitar chords went and sounded good together, but if anyone mentioned the ‘key’ of a song, I glazed over, as I didn’t really know what that was. 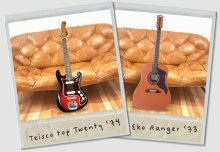 It came as a revelation when I read a book by Rikky Rooksby (https://rikkyrooksby.com/) ‘How To Write Songs On Guitar’ which introduced me not only musical ‘keys’ but also the Roman Numeral method of the chords contained in any particular key – I read this and something clicked into place. It’s my thinking that a great many follow this same root to playing the guitar, certainly those that are self taught and bypass learning any theory. In fact I can remember seeing Fran Healy from the band Travis being asked what key ‘Why does it always Rain on Me’ was in, and he embarrassingly confessed he didn’t know. The Roman Numeral method is a fundamental aspect of music theory that is widely adopted by the music industry when it comes to songwriting, composing, recording and production. And it is not difficult to grasp. 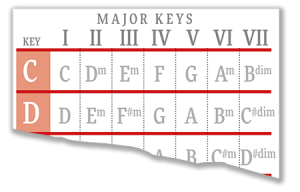 Most popular song are written within the Major and Minor keys. The idea behind the Roman Numeral method is that you can swap from key to key, and any sequence will basically sound same. So, if you use the chords in the sequence I, V, VI, IV whether you play these using the key of C, D, E etc, they will sound the same. This is demonstrated particularly well by the satirical band ‘Axes of Awesome’ who use chords I, V, VI and IV to show how many hit songs use this sequence in their video. The most popular chords used in songs are I, IV and V, followed by VI and II; next is III – but the VII is the least used. There is obviously a lot more to music theory, depending on how deep you want to go into keys, modes, scales etc, but you will find that most popular and well known songs are not particularly complex in form and structure.